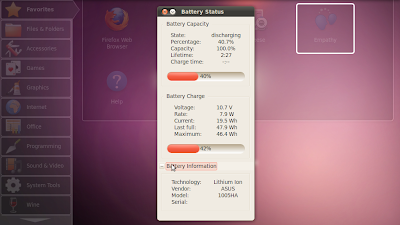 Battery Status is a project for GNOME, that shows information about laptop battery state. It comes with a lot of additional features, so usual icon of GNOME Power Manager can be removed from Notification/Indicator Area. 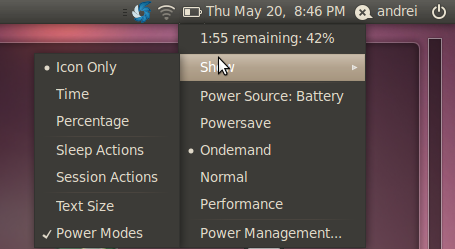 Don't worry about the battery icon in Ubuntu being a part of the Indicator Applet, when you first add Battery Status to the panel, it will ask to remove the default battery icon (but will keep the Indicator Applet). You can also set the icon display the remaining battery (either minutes or percentage) in the notification area. But that's not all Battery Status can do and Battery Status 0.1 has just been released so more tweaks to come! For more info, visit Battery Status webpage. (make sure you put this in your startup applications). Battery Status uses GConf for settings so if you want to change anything, you can find all the settings in /apps/battery_status. 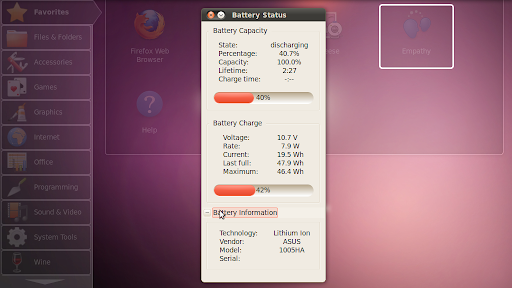 If you're not using Ubuntu, see installation instructions for Battery Status, HERE. Then locate the two 'BAT0' entries and replace them with 'BAT1' (without the quotes, of course). Special thanks to bungh0l3 for this fix!